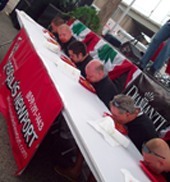 Pasquale’s Pizza Newport proudly sponsored The Spaghetti Eating Contest held at the Newport ItalianFest in June. 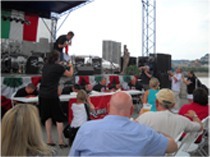 A record crowd gathered to watch six local firemen compete, hands free, to eat a pound of spaghetti in record time! 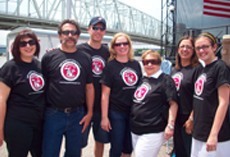 Click here to watch a video of this fun event! 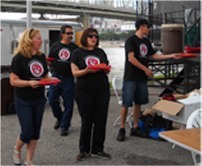 Getting ready to serve the spaghetti. 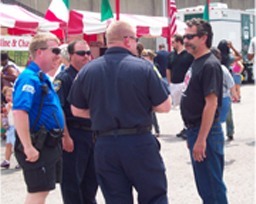 Vince chatting with Newport’s finest. 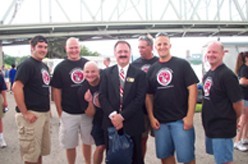 WEAR THE MUSTACHE AND SAVE SOME CASH! Check out this slide show of people who wore the 'stache ! Tell them Pasquale’s sent you!